AFT Local 1904 will visit the Mt. 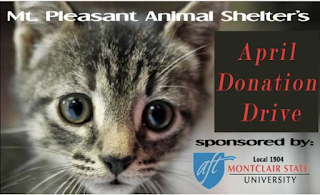 Pleasant Animal Shelter to help care for the animals on Saturday, April 16, 2016 from 9:00AM to 12:00PM. The shelter is located at 194 Route 10 West, East Hanover, NJ. Space is limited. To reserve your spot, email the AFT 1904 Local's office at union@mail.montclair.edu by Wednesday, April 13th and use the subject line "Mt. Pleasant Animal Shelter"
Can't volunteer but still want to help? The shelter does need donations to help feed and provide medical care for the animals. The AFT Robert G. Porter Scholars Program offers four 4-year, $8,000 post-secondary scholarships to students who are dependents of AFT members, as well as 10 one-time $1,000 grants to AFT members to assist with their continuing education. At the February 10th General Union Meeting two motions to amend the Local 1904 Constitution and corresponding Bylaws were introduced for a first reading. Each of these changes, which will be debated and voted on separately, would need approval by 3/4 majority of the full-dues paying members at the next General Union Meeting on March 16th to pass. Our Constitution requires that a first reading take place at a General Union Meeting with the motion to amend documents then distributed to full members. This email constitutes that distribution. A vote will be taken on the documents at the next General Union Meeting which, again, takes a two-thirds majority of all members voting to pass either or both of the revisions. The full motions to amend are linked below and we expect a full hearing and discussion of these issues before a vote. If you have any question please send them directly to President Wolfson at Rich.Wolfson@aftlocal1904.org. If you have an amendments to the documents, bring those to the meeting for consideration.